Are you wondering how to get rid of your unsightly and definitely, undesirable spider veins or the varicose veins? Schedule an appointment with the doctors at Nitai Medical and Cosmetic Centre, to avail the best sclerotherapy service in Melbourne. This treatment is regarded as the most effective treatment for spider veins and varicose veins. It is certainly a safe procedure (with well understood risk profile) and has been around for over two decades in Australia. Sclerotherapy could be used alone for effectively eliminating large veins or it could be performed in conjugation with some other relevant procedures, as recommended by your doctors. Sclerotherapy is mostly used for effectively treating smaller accessory veins to arrest further deterioration and progress toward the unsightly bulging veins. Nitai Medical and Cosmetic Centre is the most reliable and proficient provider of sclerotherapy treatment in Melbourne. Our highly esteemed, certified and fully-qualified sclerotherapist Dr. Singh delivers world class treatment. No other treatment could match the efficiency and effectiveness of sclerotherapy in treating leg spider veins. You need to schedule an initial consultation so that your doctor could thoroughly assess your clinical condition and recommend unique treatments suiting your individual requirements. Your doctor would be evaluating the severity and extent of the damage. You would be getting an idea about the number of treatments that would be required in your case to completely get rid of this issue. You are free to ask questions relevant to the procedure and treatment. 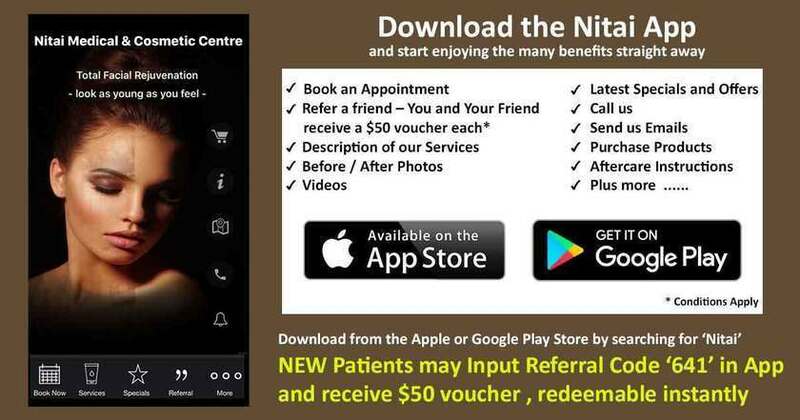 The doctors at Nitai Medical and Cosmetic Centre would be explaining to you all treatment details including the aims and outcomes so that you are not taken by any surprise. Varicose veins are unsightly bulging veins that are often triggered by aching, tired or heavy legs. In certain severe cases, you could experience varicose veins that could rupture or even cause ulcers. Usually, varicose veins are found in the thighs and legs, however, in some exceptional cases, they are present in the groin. Spider veins are supposed to be the thread-like veins which are visible and present on the surface of the skin. They could resemble a web-like maze or starburst clusters. Spider veins are commonly found on feet, ankles, and even thighs. They could be found on the nose or the face. Sclerotherapy treatment involves a procedure in which an extremely fine needle is used for injecting a solution that would seal off undesirable veins. The body, thereafter, breaks down these unwanted veins naturally just the same way it gets rid of bruises. There is no problem, however, of restoring the blood circulation that takes place through the normal veins. Sclerotherapy could be performed for treating the visible veins present on the skin’s surface and in such a case it would be called Surface Sclerotherapy. However, this procedure is often referred to as Micro Sclerotherapy because extremely tiny gauge needles are usually used in this procedure. Sclerotherapy may be performed on veins situated below the skin’s surface. In order to see the precise position and location of the deeper veins accurately, a special ultrasound would be required and hence, this type of sclerotherapy is usually referred to as Ultrasound Guided or UGS. This type of non-invasive procedure is very effective in targeting and treating successfully huge varicose veins and it also takes care of underlying blood flow issues without any surgery. In the case of very large varicose veins, however, long-term results could be less reliable. An extremely fine needle would be used for injecting the sclerosant right into the affected or targeted veins. Thereafter, a cotton ball along with a paper tape would be applied to the treatment areas. After all the targeted veins are injected, the leg would be wrapped using a proper compression bandage for about 24 hours. You could be advised to wear a compression stocking for about two to three weeks if larger veins have been treated. You would be allowed to drive post treatment and you must remain ambulant and active. Avoid long haul flights for some time after the procedure. However, seek clinical advice. What Type of Results to Expect? Most of the patients would notice a remarkable improvement in their condition. Varicose veins and spider veins would fade dramatically. Our doctor would be informing you about realistic treatment expectations after a thorough clinical assessment prior to the procedure. How Long Would The Results Last? A majority of the treated patients would be achieving permanent outcomes. However, depending on the exact cause that triggered spider veins, you would see the emergence of new veins over time and that would necessitate further treatment. Moreover, some patients would be requiring ongoing treatment for maintaining the spider veins that reoccur post the treatment. Thanks to the tiny size of the needles used, the injections are basically painless. However, the injected medication could prove to be slightly uncomfortable and may cause a stinging sensation. You may experience a wee bit of tenderness and discomfort in the affected areas for about a week. There could be slight bruising and swelling at the injection sites. Ankles could look swollen and some lumpy clotted veins would be present for a number of weeks post the procedure. You would be noticing an overall enhancement in appearance after about four to maximum six weeks. But post-varicose veins treatment recovery could take much longer than spider veins. The brown pigmentation would be persisting for almost two years. Itching in the vein route after the treatment that may last for a couple of days maximum. Light brown discoloration or transient hyperpigmentation that may persist for about 4 months to 12 months. Mild to moderate tenderness, bruising and discomfort around or at the injection sites. Who Should Not Opt for Sclerotherapy Treatment? Pregnant women and even those who are breastfeeding should not undergo this procedure. When you come to Nitai Medical and Cosmetic Centre for consultation regarding sclerotherapy in Melbourne, you must discuss with your doctor if you have a clinical history of blood clotting. How to Get Expert Guidance? Schedule an initial appointment with us at Nitai Medical and Cosmetic Centre, the best sclerotherapy clinic in Melbourne. Our expert team would be answering all your queries about the procedure. Your condition would be evaluated accurately and doctors would be recommending appropriate treatment and would suggest the number of sessions required in your case. Contact us today and find out if you are the right candidate for sclerotherapy Melbourne.